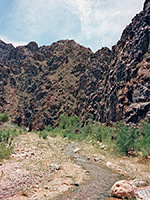 One and a half miles before Peach Springs Canyon meets the Colorado River, it is joined from the east by Diamond Creek, a small but year-round stream that emerges after a long journey through remote, branched canyons, flows over the road and down to the main river. For vehicles that cannot cross the water there is a carpark and camping area just before the crossing, and this provides a suitable base from which to explore the creek and its very peaceful surroundings. 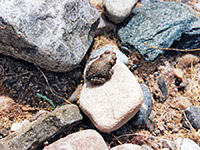 There are many small creatures in the undergrowth alongside the creek; snakes, various types of lizards and hundreds of red-spotted toads - a distinctive species found in a variety of habitats throughout the Southwest. The stream is shallow, but flows swiftly through a relatively narrow gorge, with much greenery around the waters, sandy banks at either side and small pools containing many tadpoles in early summer. The canyon walls are red/black in color; old, sombre, crumbling granitic rocks, simultaneously pretty and oppressive, especially in the stifling, windless heat of summer. This is a dramatic landscape, almost primordial in appearance, and is a place that few people ever visit. 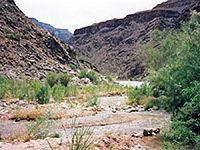 There is no established trail along the canyon although Diamond Creek is wide and shallow enough to allow for easy walking upstream, which is possible for many miles. At one point, the creek becomes quite narrow for a few hundred feet, with deeper pools and small waterfalls; there are also several interesting side canyons, clear water springs and a general air of solitude.